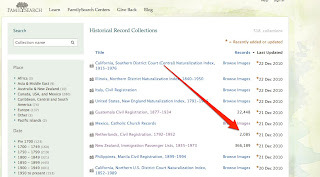 With the addition of the Germany Births and Baptisms, 1558-1898 with 32,877,879 records on December 30, 2010 FamilySearch.org Historical Records Collections completes a year of fantastic growth in the availability of original source records and indexes on the Internet. In all it appears that 64 record collections were added during the month of December alone. 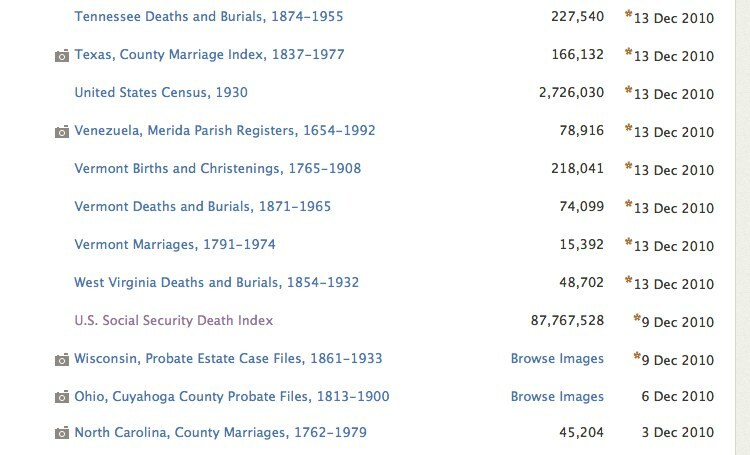 Some of the collections, like the Social Security Death Index with 87,767,528 records are huge additions to the online searchable world. Many of these millions of records have never been available previously outside of microfilm rental. Here in Mesa, we are looking forward to more of the Mexican States being added in the coming year to the huge collection of Catholic Church Records. Presently, there are over 16 million images with 25 of the states and the Federal District already online out of the total of 31 states plus the Federal District (Distrito Federal). Some of these records are invaluable for those who have never had access to them previously. Return to Primary, Secondary or what? In the GPS, Sources are either Original or Derivative. Information is either Primary or Secondary. Evidence is either Direct or Indirect. These definitions make a lot of sense to me, and have been adopted by almost all of the professional community. You will hear them used almost exclusively at conferences. Source type—is it an original or a derivative? Information type(s)—is each piece primary or secondary? Evidence type(s)—is each piece direct or indirect? The confusion arises, not with the analysis, but with the definitions. When researchers talk about a "source" are they referring to a particular document or one entry on the document? From the Guidelines discussion, it is clear that they are defining a source as a physical document. The definition is "A source is original if it is the ﬁrst written statement, photograph, or recording of an event." There is specific admonition to "get as close to the original as possible." The point I make is that just because a document is an "original" does not mean it is accurate at all. Later copies may contain the correct information missing or wrongly recorded in the so-called original. It is only by examining a document in its totality as part of the larger body of evidence that anyone can accurately judge the reliability of a document for any particular item. The Guide defines primary information as, "A piece of information is primary when it is recorded by a knowledgeable eyewitness or participant in that event, or by an ofﬁcial whose duties require him or her to make an accurate record of the event when it occurs." It goes on to give the following definition of secondary information, "Secondary information is supplied by someone who was not at the event and may include errors caused by memory loss or inﬂuenced by other parties who may have a bias or be under emotional stress." I prefer the legal method of determining the reliability of a witness. There is usually no way to evaluate the reliability of the creator of a historic document, he or she may have been accurate or drunk. Can you tell by looking at a death certificate, for example, the mental state of the person who compiled the information? Do you really think that the doctor or coroner entered all of the information into the certificate form? Look at this Death Certificate. Is this an original or derivative source? How do you know? Is the part written by hand primary or secondary? How do you know? What was the cause of Henry Tanner's death? Do you put any weight on the point that Henry fell on March 13 and didn't die until March 21st? In order to reach reasonable conclusions, it is essential to perform a complete analysis of each resource. The process includes careful scrutiny of each fact (stated directly or implied) to determine plausibility, possible contradictory evidence, and impact on the particular research project. At the same time, it is important to remember that a single genealogical resource is analogous to a single man—neither is an island, and neither stands alone. Every effort must be made to identify additional resources and connections to the particular project. The fact that the above Death Certificate could be termed an "original" document or a "primary source" is meaningless if the handwritten information was added after the date of the typewritten information, which may have been compiled at an uncertain time after the incident in question. Talking about the GPS and Guidelines is only helpful if the researcher is aware that they exist and is not making his or her conclusions based on what they may have heard at a genealogical conference. Here is a common definition of a "primary source." "A record that was created at the time of a event by a person who had reasonably close knowledge of the event." See About.com. Do you see any difference between this commonly used definition and the one prescribed by the BCG? My point is that the use of these facile definitions often obscures the very analysis they are supposed to promote. In case you didn't catch the difference, BCG uses the terms primary and secondary to refer to individual pieces of information, whereas the common definition encompasses the entire record. My argument is not with BCG but with the common use of the terms. If you are a genealogical researcher and have never thought about these distinctions, you are not part of the solution. If you are presented with a document, like the Death Certificate above, and do not question the fact that it is partly handwritten and partly typed, then you need to read and think about the Guidelines on the BCG site. The television commercial version of genealogy is all smiles and lovely family reunions, the reality may be far from perfect and may involve deep seated family conflicts. One of the first things recommended to any budding genealogist is to contact family members for their input. But what if you are not on speaking terms with your family? What if you don't even know who your parents were and whether they are alive or dead? What if factions of your family have been fighting for so long that they have forgotten the basis for the first disagreement? What if your family lives in a different political entity and your country is at war with theirs? What if the reason for the family feud is petty or insignificant, but you haven't talked to your relatives for years? It is too simplistic to simply advise that you kiss and make up. Life is not as simple as all that. The fundamental question to ask yourself in these situations is whether or not you, as an individual, can ignore those issues and move on a generation or two and research anyway? Sometimes an incident in the past, murder, suicide, or other criminal acts cloud the family tree. Are you willing to put those problems in perspective and still do genealogical research? Delving into your family's past is not for the queasy or faint-hearted. Almost everyone would like to find out they are related to some famous person or even royalty, but the truth is that in the lottery of genealogy, you have just as good a chance of turning up a few scoundrels as not. What if your family will not talk to you about genealogy? So what? None of your dead relatives can talk to you so treat your uncooperative relatives as if they were unavailable and do the research anyway. This topic must be an issue with a lot of potential genealogists, the featured speaker at the Mesa, Arizona Family History Expo is M. Bridget Cook author of the book, Handling and Healing the Skeletons in Your Genealogical Closet. Ms. Cook's previous book is a little more descriptive of the problem, "Shattered Silence, the Untold Story of a Serial Killer's Daughter" written with Melissa G. Moore. Serial killers aside, what about the problem of not being able to identify your parents at all? This may be the classic adoption problem or simply a lack of information. I have been faced with that issue from time to time with patrons at the Mesa Regional Family History Center. Unfortunately, the tools available to a genealogist are limited in their ability to find and/or identify living individuals or even those who have died withing the past few years. But there are places to look outside of the normal genealogical records and find extensive information about living people. I have written about this issue several times in the past. For example, Genealogy in the present tense. The issue in this post is overcoming the fear, concern, inertia or whatever caused by unavailability, indifference or even outright hostility on the part of relatives. My own response is to treat the problem as if it didn't exist. I am a researcher. I can't necessarily change people's attitudes, but I can do research. The members of my family may not want to communicate with me or discuss some hidden family secret, but nearly all of these issues can be overcome with diligent research, especially if I am willing to pay for more sophisticated online sources. If relatives cooperate, I view that as a bonus, not a prerequisite. Don't expect your family to applaud your efforts in preserving family history. Genealogy is not a spectator sport and unless you are self motivated and not overly concerned with recognition, you are probably better off taking up some competitive activity than in researching in libraries and other record repositories. The RootsTech 2011 Conference announced its keynote speakers today. The national speakers reflect the conference’s focus on creating a forum where genealogy technology users can discover exciting new research tools and technology creators can learn the latest development techniques from industry leaders and pioneers. The conference will be held February 10–12, 2011, in Salt Lake City, Utah. Shane Robison, Executive Vice President and Chief Strategy and Technology Officer for Hewlett-Packard Company. Mr. Robison is responsible for shaping HP’s corporate strategy and technology agenda and oversees the company’s corporate marketing function. He is instrumental in steering the company’s multibillion dollar research and development investment and leads the company’s merger and acquisition activities. He also has responsibility for worldwide corporate marketing activities, including brand strategy, internal and external communications, digital strategy and hp.com, environmental sustainability, social innovation, and customer intelligence. Brewster Kahle, Founder, The Internet Archive. A passionate advocate for public Internet access and a successful entrepreneur, Brewster Kahle has spent his career intent on a singular focus: making information free and accessible through digital means. Mr. Kahle created the Internet’s first publishing system and has helped revolutionize the electronic publishing market. Through the Internet Archive, Mr. Kahle is working to create an online catalog of every book ever created. At the same time, Mr. Kahle cofounded Alexa Internet, a service that collects data on web browsing behavior for future analysis. The services provided by Alexa Internet are used in more than 80 percent of web browsers today. Curt Witcher, Historical Genealogy Department Manager, Allen County Public Library. Mr. Witcher’s success in community involvement, integration of technology in library science, and collaboration with various organizations has made him a highly visible individual in the genealogical community. His dynamic presentation style has made him a highly favored presenter among a wide variety of audiences. He is a member of the Genealogy Committee of the American Library Association and past president of the National Genealogical Society and of the Federation of Genealogical Societies. He is coeditor of the 1987 through 2000 editions of the Periodical Source Index and was a research consultant for both PBS Ancestors series. Jay L. Verkler, CEO, FamilySearch International. Mr. Verkler currently serves as president and CEO of FamilySearch, sponsored by The Church of Jesus Christ of Latter-day Saints. FamilySearch has gathered the largest collection of genealogical records in the world. Operations include worldwide image and information collection, product and tools delivery, and patron services in over 4,600 family history centers around the world. Mr. Verkler previously served in various executive positions within innovative Silicon Valley companies such as Oracle Corporation, inCommon Inc., TIBCO Software, Vitria Technology, and Sales.com. Mr. Verkler studied electrical engineering, computer science, and chemistry at the Massachusetts Institute of Technology as well as Japanese and Asian studies at Harvard University. RootsTech is a new conference designed to bring technologists together with genealogists so they can learn from each other and find solutions to the challenges faced in family history research today. The conference’s activities and offerings are focused on content that will help genealogists and family historians discover exciting new research tools while enabling technology creators to learn the latest development techniques from industry leaders and pioneers. iPads, iPhones, MacBook Pro, FamilySearch.org, all sorts of things happened to me this past year to change how I do things as well as what I do. During the year, I had a slow but steady growth in the popularity of Genealogy's Star blog and that fueled a lot of changes. The year started off with the opportunity to be a Blogger of Honor at the Mesa, Arizona Family History Expo. That set the tone for the whole year of blogging and I got one of my first introductions to the Blogging community. One of the most interesting events during the year was the first ever Blogger's Day at FamilySearch's heaquarters in Salt Lake City, Utah. The contacts made at that meeting have developed during the rest of the year into a number of interesting projects. Some of which I will be able to share with my readers during the coming months. One of the projects we are now well involved in is transferring the huge resources of the Mesa Regional Family History Center to the FamilySearch Wiki. We set up a committee of interested volunteers and they have started to transfer the Center's library of Quick Start Helps and other materials to the Wiki. I am really grateful for all of the help and contacts I have made with the FamilySearch folks. They have been more than helpful and considerate of some of my ideas. During the year, I taught well over 200 classes from one attendee to hundreds. I will continue teaching in the coming year beginning on Monday, January 3, 2011 with three classes that day at the Mesa Family History Center. Probably some of the most satisfying experiences involved helping people breakthrough barriers and find information about family members. There were quite a few notable experiences during the year with some real success stories. 2010 seemed to be a year of technology with the introduction of the iPad and updates in most computer systems. I found dozens of new uses for my iPhone and my wife began using her iPad in ways that she never imagined. I finally switched completely back to using Apple computers with my acquisition of a new MacBook Pro and found it to be one of the best changes I have made in computers. I now have a machine I can actually use on the spur of the moment and is portable enough to use anywhere and anytime. Online there were a lot of really interesting new developments. Some of the ones most notable include the implementation of the FamilySearch.org website and consolidation of resources. 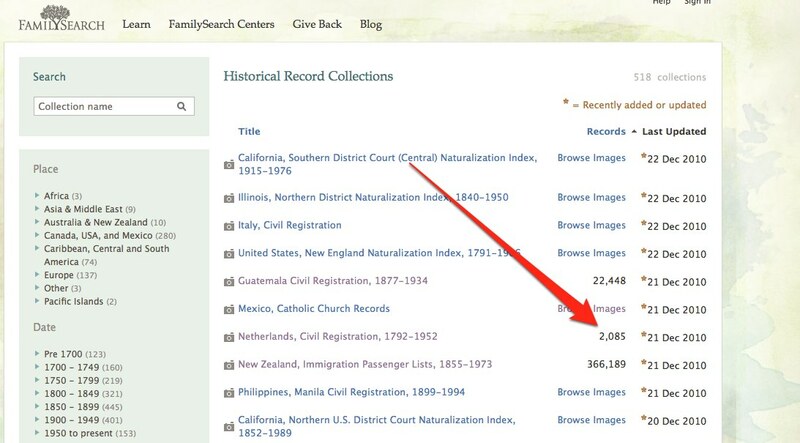 I am sure that 2010 will go down in history as the year FamilySearch increased its online presence with millions and millions of images of original documents. 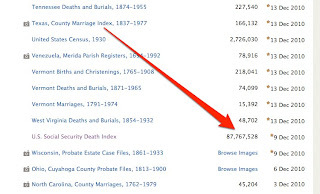 Although FamilySearch Indexing and the addition of the Historical Records Collection have been going on for some time, we really began to see the potential of this huge effort in 2010. Well, I am starting off 2011 with a bang, being a Blogger of Honor again at the Mesa, Arizona Family History Expo, presenting two classes for the first time, being a featured Blogger at the RootsTech Conference in Salt Lake City, Utah in February, continuing my projects with FamilySearch and writing away at this Blog. Stay tuned for new developments. Much of the genealogical literature encourages researchers to consult “primary” records and at the same time decries the use of “secondary” records. This dichotomy is overly simplistic and often misleading. In examining a variety of documents it is frequently impossible to categorize any given source as either primary or secondary or whatever. Few of the documents considered to be “primary” sources are in reality documents created at the time of the event by a first hand observer. Let me take as an example a death certificate. 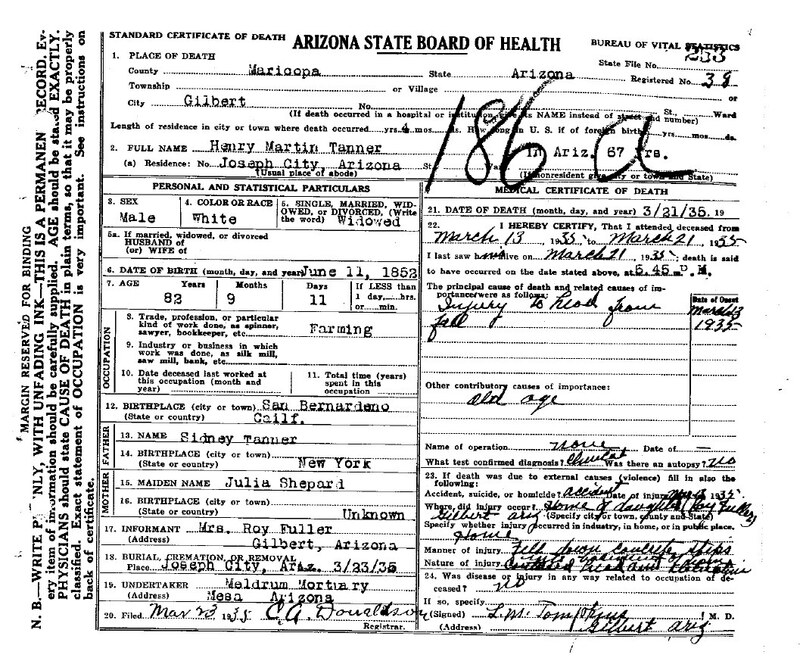 Transitional genealogical literature would say something like, “a death certificate would be a primary source for the date of death but not for the date of deceased's birth.” In fact, any particular death certificate could be secondary or further removed as a source for the date of death and more reliable for the birth date. Categorization of records can produce a false positive or a false negative. "Primary" Resources: Those that recount an event at or close to the time it happened; original records of events and may include: diaries, journals, state or federal census records, courthouse records such as deeds, will probates, birth or death records, baptism or marriage records. Also included as primary sources would be ship's passenger lists and military records. "Secondary Resources: Published records, including: family histories, indexes or compilations of census or marriage records, any sort of history (county, state, etc. ), and collections of cemetery inscriptions, for instance. 3. any facts to which the lawyers have agreed. In addition, the jury is routinely admonished to wait until they have heard all of evidence before making a decision. As you can see, the concept is not to apply some sort of evaluation level to an individual document or record but to consider the relationship that the record has to the entire body of evidence available and to have the patience to wait until all of the evidence is presented before making a final decision about the issues of the case. It seems that I am frequently dealing with someone who has found a primary source document and thinks the evaluation of the believability of the "evidence" contained in the document is basically over. After all, the document is a primary source! Simply locating a primary source document, no matter how defined, is not an excuse for discontinuing research. Until the document is evaluated in the context of all of the "evidence" available, no decision about the investigation can or should be made. Routinely researchers come to me with issues regarding contradictory evidence. Just recently, one researcher was stopped by the problem that the death certificate, census records and a ship manifest did not agree as to the date of birth of the ancestor. My response was, “So what?” All that means is you need more evidence. In this particular case we looked for and found a marriage record in the newly added records on FamilySearch.org. The marriage record lead me to believe that the ship manifest was likely not the same person, or if it was, the record was inaccurate as to the age of the immigrant. 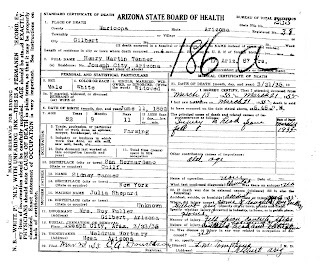 Returning to the death certificate, there is no way to tell whether or not any of the information was actually gathered or recorded at or about the time of death especially if the information is inconsistent with other documents and records.The mere fact that the record may have been created at or near the time of the event does not, in itself, give any more credence to the information contained in the document. In deciding the facts in this case, you may have to decide which testimony to believe and which testimony not to believe. You may believe everything a witness says, or part of it, or none of it. (8) any other factors that bear on believability. The weight of the evidence as to a fact does not necessarily depend on the number of witnesses who testify about it. Some of these instructions merit another post, but suffice it to say that simply deciding whether a document is a primary or secondary source would have little or no value in deciding the ultimate issues of the case. So what is the use of considering whether a document is a primary or secondary source? The distinction is actually quite meaningless and may, in fact be impossible to determine, but the terms have a nice ring to them and they have been repeated so many times that that they taken a the truth. In the real world, very few documents will prove to be completely primary source material. Thanks to DearMYRTLE for the heads-up on the announcement from Millennia Software of the update release of Version 7.5 of Legacy Family Tree. The new version will have full FamilySearch certification for New FamilySearch to sync, update, reserve ordinances and request ordinances to print Family Ordinance Request Forms (FORs). Geoff Rasmussen will be teaching two classes at the Arizona Family History Expo to be held on January 21st and 22nd in Mesa, Arizona. Quoting from the FamilySearch website, "Certified products include programs, services, and utilities that are compatible with new.FamilySearch.org (Family Tree) and conform to FamilySearch standards and systems. 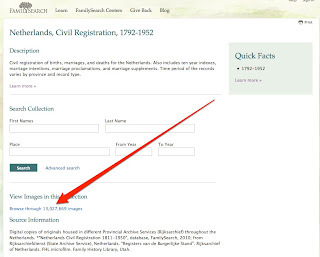 Presently, new.familySearch.org and the access of new.FamilySearch data through certified products is only available to members of The Church of Jesus Christ of Latter-day Saints." It is interesting, I was using the Legacy program just today to update events in my own family group sheet. I must have been in the program before the announcement came out. File Sharing? GEDCOM or what? 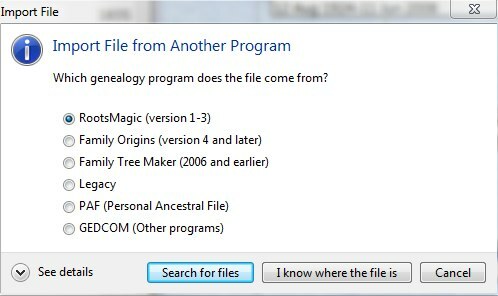 The choices include various versions of PAF, the Ancestral File which is no longer in existence, the Pedigree Resource File which is still sort-of in existence, TempleReady which is no longer in existence, PAF for a Palm OS which is still in existence (2010), and GEDCOM 5.5 which is still supported by most other genealogy programs. From a developers standpoint, there is almost no incentive to support your competitor's file format. Why would you want to make it easy for someone to switch programs? In genealogy, the issue of file sharing arises because of the need to share the information without re-entering massive amounts of data. 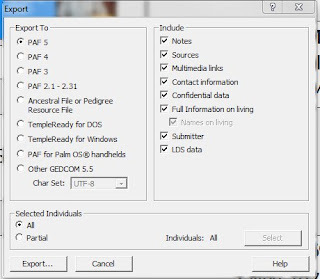 The current version of Ancestral Quest, the successor to PAF, has the similar options for importing files as PAF, GEDCOM or an Ancestral Quest file. However, the program supports exports to Heritage Family Tree Deluxe, Family Tree Maker, various versions of PAF and various older versions of Ancestral Quest. The version of Family Tree Maker supported is not specified. Again, if your particular program is not listed, you option is to create a GEDCOM file and import the information in that manner. Your options for export are limited to GEDCOM only. Even though Family Tree Maker is specified as supported, the import will only work with versions 2006 and earlier and the current version is 2011. Legacy Family Tree will import from another Legacy file or from PAF directly, all other program files would have to be exported to a GEDCOM file. Your choice for export are also limited to Legacy, PAF or a GEDCOM. I have version 2010 of Family Tree Maker for the PC, so I can only write about that version, but its import function supports previous versions of Family Tree Maker, Personal Ancestral File, The Master Genealogist, Legacy Family Tree, Personal Ancestral File and GEDCOM. The export function supports some previous versions of Family Tree Maker and GEDCOM. On the Mac side of things, Family Tree Maker for the Mac has fewer options than the PC version, it is not clear whether or not the Mac files will also import into the PC version or PC to Mac. But when I tried to open a PC file with my Family Tree Maker for the Mac, it did not recognize the file. In the Linux tech community there is some discussion and use of the open source program, Gramps, This free program is limited in its use in both Windows environments and on Mac OS X. However, I note that Gramps supports both import and export of GEDCOM files. I could go on and on, but the point is this. There are few options for sharing files directly between different genealogy programs. Family Tree Maker for the PC and RootsMagic seem to have the most options, but all of the programs support a GEDCOM import. That may seem like good news until you realize that if you use GEDCOM to transfer data between genealogy programs you will very likely lose data in the process, even if you are transferring between the same programs i.e. from PAF to PAF. Here is the bad news. There is presently no solution which is the best reason for the project to build a better GEDCOM and improve the chances of transferring information. If you would like more information please see BetterGedcom. There are a number of options for sharing the information without actually sharing the file itself. RootsMagic will create a sharable CD with all of your file information, but the information is read only meaning the file cannot be edited by the recipient. If you would like to get an idea of the complexity of file sharing options and have a word processing program like Microsoft Word or OpenOffice, when you go to save a file, check out the different possible formats for saving. Presently, there does not appear to be any major movement in the computer world to solve the file compatibility issues. Just a note about fake aggregator websites. On my other active blog, Walking Arizona, I receive a comment from time to time congratulating me on a really good post and telling me the post has been included in a "Best Blogs of Mesa" website. Its nice to feel wanted, but the site is bogus. It is an aggregator meaning that it automatically collects links to websites and republishes them. In addition to violating copyright laws, these sites are like parasites eating away at legitimate sites and cannibalizing content. There is a legitimate aggregator function, like Google Reader, where the users add sites they wish to review with new content. But these illegitimate sites have no original information at all, they are mechanical listings of other sites with ads, hoping to make some advertising money from accumulated links. How do you tell if you have reached such a site? Usually, the site comes up on a specific search but the search term is no where to be found on the site. The site will have no content but will look like a listing of other websites. If you reach such a site, just close the browser window and go back to your search list. Do not click on anything, it only encourages the practice. Anyone who has been shopping at a mall lately understands the concept of concentration of resources. There is a synergy in having a location with a variety of options. People may not travel all the way across town to one specialty store, but if they have many choices they will get in their cars and drive to mall. There is the same synergy of resources at a genealogy convention or conference. There are a number of needs fulfilled by both "going to the mall" and also by attending a conference. These include a social function, an educational function and a commercial function. Genealogy has a tendency to be rather solitary. Even though there is an emphasis on reunions and family gatherings, there is only so much genealogy most family members can stand and a dedicated researcher will not often find someone with the same commitment and interests, especially someone with whom they are related. Conferences provide the social contact missing from the day-to-day genealogical experience. When I go to the Salt Lake Family History Library, I do so expecting to see people I know, but I do not go there expecting a social experience. I can spend the entire day and not speak to anyone. In both the mall experience and the conference, there is a group experience, even if you don't know anyone you are all there together in a common enterprise and having a similar experience. In the more developed genealogical community, going to a conference can be decidedly social. After attending conferences for years and meeting the same people over and again, you can participate in the larger community of genealogists with similar interests as opposed to those who do not attend conferences. In a conference such as the Arizona Family History Expo, coming up on January 21st and 22nd, 2011, it would not be unusual for me to meet dozens, even hundreds of people I know or recognize. Last year when I attended as a Blogger of Honor, I had a decidedly different experience. It was a cross between being a conference attendee and having a commercial booth. In past years, I was part owner of an Apple Macintosh software company and we spent many years going to the MacWorld Convention in San Francisco. It was one thing to go to the convention and it was an entirely different (and a lot more tiring) experience to have a booth and participate in all of the pre-conference and post-conference activities, like going to a dinner reception with all of the heads of Apple Computer. I have to admit that an Apple convention in San Francisco is not exactly the same as the Mesa version of the Family History Expo, but they are actually very similar experiences. This year as both a Blogger of Honor and a Presenter, I assume I will have an even more challenging experience. Conferences also have an educational side, with a variety of classes. In a conference like the Arizona Family History Expo, the choices are varied and interesting but there is usually one class (sometimes more) in each time slot that stands out in your interest. On the other hand, at a huge conference like RootsTech in Salt Lake City, Utah scheduled for February 10th through the 12th, 2011 there will be ten or more choices at each time slot and the decision becomes much harder. Having attended many genealogy related conferences, I usually try to make a decision as to what my main interest is going to be and select my classes based on a theme, such as technology or new developments or whatever. As an official RootsTech Blogger, I assume I will have a really different experience. The commercial function of a genealogy conference cannot be under estimated. It is not like you can walk into your local Walmart and buy genealogical programs or services. There are very few opportunities to get acquainted first hand with the genealogy related vendors. Both the Arizona Family History Expo and the RootsTech conference will be a very good opportunity to see, meet and discuss genealogy related products. If you have not been to a genealogy conference, please consider attending one or more in 2011. You might find out that there is a whole different side to genealogy you never suspected existed. Copyright is a statutory right which means that the right is created by a statute passed by a governing authority, usually the national government. Generally, works consisting entirely of information that is common property and containing no original authorship is not subject to copyright. Information such as names, dates and relationships is not usually subject to copyright or any other claims of intellectual property. For example, in a directory listing such as a telephone book, the names and telephone numbers are not subject to copyright, although the layout of the book and the advertising may be. What makes this area of the law difficult is problem that portions of a work may be subject to copyright, while other portions are not. There is a real challenge in determining if a particular work is subject to a copyright claim and if so, who owns the claim. This may be especially true in a genealogical file, where some of the information was copied from other sources and much of the material may be lacking in attribution. Republication of a work does not confer any added copyright protection. If you publish information and you have an expectation that it will be covered by copyright, it is very wise to become educated in this area. From our house to yours, best wishes this Holiday season and a happy and prosperous New Year. In my last post on this subject, I talked about the advantage of using metadata to help identify background information about digital photographs, including geolocation information. There are two ways to obtain metadata, straight from the camera or scanner or by adding the information through a photographic editing program. Both Apple and Microsoft operating systems (and other too, like Linux) allow you to name and rename photos. The default name given to images by both cameras and scanners is usually some arbitrary number and or letters, occasionally followed by a date and time. Most scanning software and some of the software for downloading images from a digital camera, also let you select a name for the files you are downloading to your computer. But unless you take the time to specify an alternative name, the images load onto your computer as "HPCX11002" or whatever. Even if you don't go any further in identifying your pictures, you should spend the time to give each one a meaningful name and perhaps identify the people in the picture. Many programs, like iPhoto and Picassa, and a number of online sites, like Flickr and Fotopedia, let you add captions and descriptions. However, if the image is moved to another computer or another program, usually that information is lost except the file name. We have come a long way from the old 8 character DOS naming conventions. File names can now contain a lot of information. I use a format for scanned images and photos that includes the date the image was taken, scanned or created. For example, a picture of a birthday party would have a file name like, "2010-12-29 Eva Overson birthday party." I view these names to be temporary, since I still need to go back and identify all of the people in the photo. Originally, we tried making a list of the names of the photos and identifying the people in a separate document, mostly handwritten and later, in a computer file. The main problem is that the identifying information gets lost or separated from the pictures. But until relatively recently, there were no other alternatives. It is clear that having the information saved with the image guarantees that the information will stay with the photo or image even if moved to another computer or used by a different program. So how do you attached or embed the identifying information into the photo or image itself? Through the use of metadata. There are a number of standards for including metadata in an image; Adobe Software has one standard to store metadata in digital images called XMP for Extensible Metadata Platform. XMP is based on XML or Extensible Markup Language. XML is a flexible format for creating structured computer documents and a variety of XML specifications exist for different applications and is an application profile or restricted form of SGML, the Standard Generalized Markup Language [ISO 8879]. XML uses tags to define (or "mark up") the identity or purpose of each piece of information in a file. Another standard for the use of metadata is more concerned with the technical information supplied by the scanner or camera and is called EXIF or Exchangeable Image File Format. This is the data that is automatically embedded in the photograph by the camera or scanner. Yet another standard is the IPTC or International Press Telecommunications Council Information Interchange Model. This standard is used by news organizations to embed information such as the title, caption, author or photographer, the date of the image and the location as well as other information. 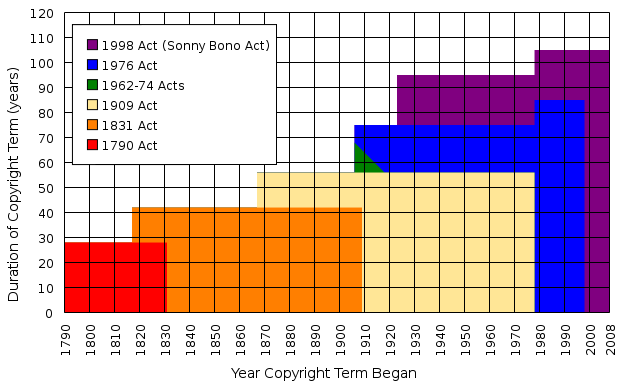 The IPTC standard has been supported by Adobe for a long time. Nearly all of the current software will recognize and support XMP, EXIF and IPTC metadata. Presently, there is no universal way to either view or attach metadata. Although some of the online "free" programs like Picassa can view some of the data, you either need to use a program like Adobe Photoshop or Photoshop Essentials to add extensive metadata about a picture. Interestingly, once metadata has been added to an image, Apple's OS X search program will find files with metadata embedded. Now, that you know a little bit about what metadata is, be sure and read my next post (or so) about using metadata to keep track of images. Over 100 Million Images/Records in December! 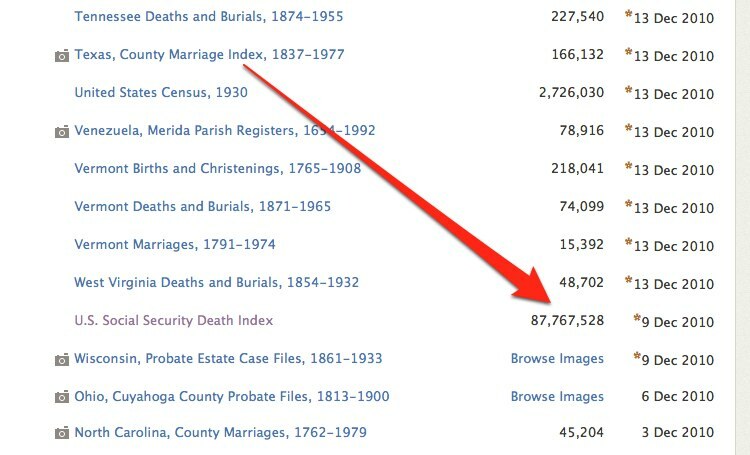 Additionally, collections like Mexico, Catholic Church Records have only images and do not show a record number but say "Browse Images." When you open the collection, you can see the number of images, in this case 16,596,760. Think of what might show up in January! As a genealogist, you may find yourself with a collection of old photographs and the fortunate few, will have names, dates and sometimes even places hand lettered on the front or back. One advantage of digital photos is that data about the photographs, the subject matter, the identity of the individuals and the place can be digitally included with the original and any copies. A considerable amount of data is automatically attached to digital photos by the camera and that more can be added, including geolocation information. Some authorities try to make a distinction between the terms "data" and "information." In our technical computer world, information is usually considered to be the raw unorganized stream of anything. Once the information is organized in a form that can be recognized by a computer, it becomes data. Using this definition, the outside world containing a birthday party is the information. When you point a camera at the party and push the shutter button, you select a portion of the overall information in the scene that is then transformed by the camera into data or in other words, a photograph. Realistically, both terms are often used interchangeably, but in order to discuss metadata, I have to make a distinction between information and data. Metadata is data about data. When you take a picture with a digital camera, the light sensor almost instantly gathers in information in the form of a photographic image. If you then consider a photograph to be a "data set" or collection of information, additional attached information about the photograph itself; the camera used, the settings, the date and time, the location and many other types of information comprise the metadata. The additional data (metadata) adds to and gives meaning to the original data. The metadata is not usually readily ascertainable from the original photograph. For example, by looking at the photogrpah you cannot easily tell what kind of camera was used to produce the picture. Using my first reference above, writing on the back of an old photograph could be considered as metadata. A paper photograph has already lost all of the associated metadata which could have been included. Unless the photographer was a meticulous professional, it is highly unlikely that very much of the surrounding information about the photo was preserved. Part of the detective work of genealogists is trying to puzzle out the metadata of old photographs to give them meaning and context and even just to identify the people. Unfortunately, many, probably almost all, present day digital photographers fail to take advantage of the metadata opportunities afforded by their choice of digital imagery. As I already mentioned, all digital cameras automatically store information about the camera and its settings with each picture. The problem is that this information is mostly hidden, either in attached files or embedded in the photographic file itself. Many of the current photo manipulation, storage and editing programs have a way to display some or all of this hidden metadata after the photo is downloaded to your computer. For example, iPhoto from Apple will show some information including the camera manufacturer, model, size of the photo, the original date, the digitized date, modification date and date the picture was imported. Another program, Picassa from Google, can show the dimensions of the photo, the camera make, the camera model, the camera date, the resolution, the orientation, whether a flash was used or not, the focal length of the lens, the 35mm equivalent, the CCD width, the exposure time, the aperture, the ISO, the exposure bias, the metering mode, the color profile name, the size of the thumbnail view, the quality of the JPEG image and the photo's unique ID. Don't worry if you don't have a clue as to what all this stuff means. Unfortunately, nearly all of that information is useful only to a photographer not to genealogist. With Picassa you can also add tags which are essentially metadata and the tags can contain geographic information. Some makes of cameras and some cameras in cell phones have GPS (Global Positioning System) capabilities and mark the location of every picture taken. This is only helpful if you have a way of viewing the attached metadata. One program that gives you virtually unlimited ability to add metadata, including geolocation information is Adobe Bridge. Bridge is sold as a companion program with either Adobe Photoshop Essentials or the full Photoshop program. There are several other programs, some shareware, that will also add the metadata. Tune in for the next installment on the advantage of metadata. Give me paper or give me death! My response is, "Do you really want to be buried in paper?" Some time ago I figured out how much paper it would take to print one copy of my main genealogy file. Estimating about 3 pages per family group record, and taking into account that some of my family group records take over 20 pages to print with all of the sources and including pictures and scans, my best estimate was around 80,000 pages. If I were to print out everything in my file, including the pictures, it would hundreds of thousands of pages. 80,000 pages is a stack of paper more than 13 feet high. I got thinking about this again after reading a short post by The Ancestry Insider entitled, "Monday Mailbox: Printed Research Guides." (I wish some one would ask me this kind of question, then I wouldn't have to think about what I was going to write). 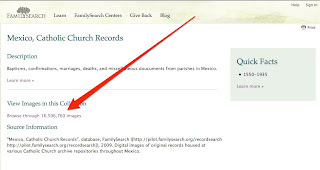 The question involved printing the FamilySearch Research Outlines which are now available on the Wiki portion of the FamilySearch.org website. 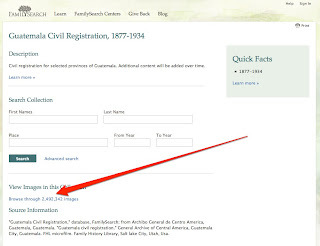 The question was, "The state and country research guides have been moved to the FamilySearch wiki. That's a good way to keep them up to date. Unfortunately they've created no way to easily print them. That's a really ill-conceived development. A lot of people like to have printed guides that they can look at when their computers are turned off." My first reaction was, "You turn off your computer?" Why would you do that? Oh, I guess I have to get back to real life. (Whatever that is). Some people actually do things without having a computer about their person 24 hours a day. (Come on, let's take this question seriously now!). The Ancestry Insider answers, "Short of that, I think you’re going to be stuck with printing your own. You will have to reset your expectations, settling for a much less desirable solution than afforded in the past. Don’t even think about printing all the pages replacing a hardcopy guide. Be choosy. Print only the articles that you need offline, short term. That’s all I’ve got. Does anyone else have suggestions?" Yes, I have several suggestions. We had this discussion last night with one of my daughters. The discussion revolved around one of my granddaughter's constant reading habit and the number of books it took to keep it going. Since I have the same habit, only much more serious because of the long term effects, I have to face that problem. The main problem with reading books and research materials on my desktop computer is just that, it is on the desktop and I am not usually reading at my desk, I am working. The solution, suggested by The Ancestry Insider, was to print off selected portions of the materials you want to read. However, I hope you do not have an inkjet printer because you will soon go broke trying to buy ink cartridges. From my perspective, sitting here in a room stuffed with paper in piles, boxes and on shelves, printing off transitory research documents or interim family group records is no longer an option. In addition to the commercially available titles sold in the Kindle store, you can also read personal documents on your Kindle (1st Generation). Each Kindle has a unique e-mail address, allowing you and your contacts to send attachments (Word and picture files) directly to your Kindle for a small fee or to your default Amazon e-mail account for free. Please refer to the links below for more information. I realize you are probably saying, but I don't want to read on a machine. Well, my suggestion is that people who say this probably have never tried it. So, if you simply refuse to try it, try to get a wholesale license so you can buy the ink and toner. My early experiences mountain climbing and exploring caves helped me develop a pretty strong sense of direction. I seldom get lost, especially in the Western U.S. But after a few experiences in the Eastern States, I can surely appreciate maps and directions. One time driving in Pennsylvania we were trying to find our way to Harrisburg from Philadelphia and managed to end up in Wilmington, Delaware. Fortunately, that is the only time I can remember ending up in the wrong state. Since I spend most of my life in Arizona and Utah, I hardly ever consult a map, unless we are trying dirt roads. As a result, I have never felt I could justify having a GPS (acronym for Global Positioning System). Surprise, I got a GPS with my iPhone and guess what? It is useful for things other than keeping from getting lost. I have found uses for the devices that I never would have imagined. GPS is sort of like Arthur C. Clarke's Third Law, "Any sufficiently advanced technology is indistinguishable from magic." It is magical to run an App on my iPhone that shows exactly where I am with a blinking blue dot, even if I can look out the window or open my eyes and I know exactly where I am. What I find is that I don't know where everything else is. So let's say I want to get to the National Archives in Philadelphia (back to Pennsylvania, my best example of someplace where you really need directions to get anywhere). With any of dozens of models of GPS devices, I can use either an online database (like with my iPhone) or a pre-installed one to locate the building and then simply push a button for directions from where ever I happen to be at the time. On some models, a friendly voice will even tell me when to turn right or left or whatever to get to my destination. We find that we also use the iPhone's GPS to locate stores, restaurants, and just about every other kind of business we need. I recently used the iPhone with Google Maps to find the Riverton Family Search Library in Riverton, Utah. By the way, the location and address are not obvious or very easy to find from the street. The building is off the main street behind a large shopping center. But with Google Maps satellite view, I could actually see the building. I was never lost but the building was not easy to find and I was glad I had a live GPS map to work with. It might be a good idea to give a short summary on how GPS works. 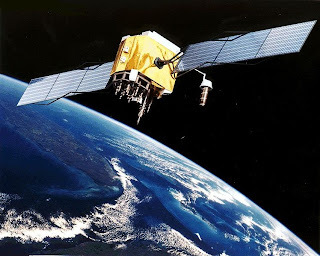 Most people now use the term "GPS" to refer to any number of small electronic devices that use either the Global Positioning System of 27 Earth-orbiting satellites (24 in operation with 3 extras for backup) and/or cell phone towers, to determine the device's approximate location. The device receives the signals and once it has four or more signals, it uses the the time it takes a signal to travel from the satellite to the receiver and then computes the distance to each satellite. The receiver then uses a method of trilateration, that is calculating the intersections of three spheres, to determine the location of the device. Trilateration methods involve the determination of absolute or relative locations of points by measurement of distances, using the geometry of spheres or triangles, In contrast to triangulation it does not involve the measurement of angles. (It is sounding more and more like magic all the time). This is an almost exact location on the Earth. No other place has these same coordinates. Just for information sake, there are actually two systems of GPS, one very accurate one used by the military and another one that is more or less accurate used by everyone else. OK, so let's suppose you want to find a cemetery in Pennsylvania. For example, the Westminster Cemetery. Finding someplace like this is now almost trivial. All you do is enter in name of the cemetery into a search engine, such as Google, and you almost instantly have an address with a link to Google Maps to show you exactly where it is located. If you are driving and enter the address into a GPS device it will calculate the distance and give you directions. Let's make the problem a little more difficult. Let's say you are trying to find Latuda, Utah. Doing a Google search produces a map with no details at all, not even the name of the place. It is on a road called Spring Canyon, so how do you know when you get there? You don't. This place turns out to be an abandoned mining town (i.e. ghost town). There is only one building left standing and without some specific map directions you would never find it. But, if you have the coordinates, you can drive right to the location with a GPS receiver. Well, let's say this, you can drive right to the location assuming you have the usual mandatory Utah/Arizona high clearance vehicle. If you are interested, Latuda is about five miles west of Helper, Utah. Oh, you say, that explains it exactly. One of the most important things to remember when using a GPS receiver is when to ignore it. My daughter routinely uses one to drive around in Texas. One day taking my grandson to summer school I used the GPS and ended up in a cul-de-sac about two miles from the school. They are not infallible. For some reason in that part of Texas, the locations are sometimes off by as much as a mile or more. Some of the newer software programs have the ability to geocode locations. This means they will look up the location in a database and add in the coordinates if the place is found. Good news. Bad news. The good news is that having the coordinates is very useful in finding the places on a map. The bad news is too often the places you are looking for no longer exist on modern maps. But, if you have the coordinates, it doesn't matter if the location is still on a map or not you can use a fancy GPS receiver to drive, walk, boat or whatever to the location. Let's see, I could always do that with a topographical map and the map didn't need batteries. So why do I need a GPS? Convenience? Not having to try and find the right topo map every time I want to find something? There are reasons. Other than the cell phone version in my iPhone, there are two major types of GPS receivers, those made for hikers and those made for drivers. Before you buy one or the other, you may wish to analyze how and where you might use the device. If you plan on hiking out into the wilderness, a car based receiver is almost useless. On the other hand, if you plan to use your device for finding houses and places of business, you may get along perfectly well with a vehicle based system. What about cost? Just a short time ago, even the most rudimentary GPS receiver was extremely expensive. Like most electronic devices time has eroded the price to point of ridiculousness many very full featured models are less than $100. They now come in color, with maps, and lot of other bells and whistles. However, like most electronics, if the price seems too low to be real, it is probably an outdated, last on the shelf, item. I had an interesting experience recently with a patron at the Mesa Regional Family History Center. I showed up to teach a class and a lady, her husband and her daughter with waiting for me as I walked in. She explained that she had an older Macintosh computer running the last Mac version of Personal Ancestral File. They had come all the way from South Dakota to Mesa for a visit and brought both the older Mac portable computer and a newer PC laptop with the hope that I could help them retrieve the data file from the Mac and transfer it to the PC. She had come to one of my classes the year before and asked me about the problem at that time. I apparently answered that it would not be a problem to move the file from the Mac to a PC. Everyone she talked to had told her that it couldn't be done. At all. Period. I couldn't believe that anyone would say something like that. Transferring data from a Mac to a PC and from a PC to a Mac is trivial. I can think of four or five ways to accomplish the task, but I only had to use one of them. 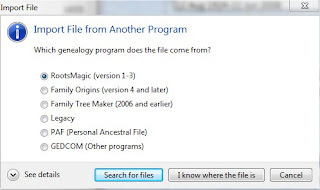 Fortunately, the PCs at the Family History Center still have 3.5 drives, so all I did was open her file on the Mac, use Personal Ancestral File to create a GEDCOM (Genealogical Data Communications) file on a PC formatted disk and then put the disk in one of the PC's drives and opened it in RootsMagic. I could have used any of the current genealogy programs, including a copy of the now old Personal Ancestral File. It took me about the same time to type this portion of the post as it took to do the entire operation. The key here is that Mac 3.5 drives (almost all of them going back for years) also recognize PC disks. Unfortunately, it doesn't work the other way around. This particular method of moving the file over from a PC to a Mac will stop working once 3.5 drives completely disappear. But this brings up a more serious problem, the perception that moving information between PCs depends on the manufacturer of the computer or the operating system. That is, some how information on a Mac is unavailable to a PC user. Presently, I work almost entirely on a Mac. Every day I move information from my Mac to my work's PC network. I can do this by opening a document on my Mac, copying the contents and pasting the document into a blank document open on my network access to my office computer, a PC. So, a Word document on my Mac instantly becomes a PC Word document on my office computer while I am sitting at home. Obviously, since a GEDCOM file is nothing more than a specially designed text file, I could move a GEDCOM file the same way. I could also simply attach the Mac created Word or other file to an E-mail message and mail it to myself at the office or even to iPhone. I can also use any kind of external storage, Flash drive, external hard drive, or whatever to physically copy the file from one computer to another, just as I did with the patron's GEDCOM file. At home, all of my computers are on the same WiFi network, so I can share data between the computers regardless if I am working on a Mac or a PC. I could also use any number of Internet type programs to share the files, from DropBox to Google Docs. As I have written before, I run Parallels Desktop on my Macs, so I am able to work with both a Mac running OS X and PC running Windows 7 on the same computer at the same time. Because of the program and the hardware, I can copy files back and forth between the Mac portion and the virtual PC portion of the operating systems. Data files are not always easy to share. Some programs have entirely proprietary file structures that are not recognizable by other applications. One of the reasons for the development of file sharing formats like GEDCOM is to overcome the challenge of unique file structures. Unfortunately, even protocols like GEDCOM are not perfect, a file may be able to be read by a target program but not all of the information in the original file will transfer. One serious consideration of choosing which genealogy program to purchase is the issue of file compatibility. Is there a reliable way to exchange information with other programs running on different computers? That is the focus of the BetterGedcom site; to update and expand the usefulness of the now outdated GEDCOM standard. It is sad that someone, especially someone purporting to give technical advice, would mistakenly tell my patron that a file from a program like Personal Ancestral File even on an older Macintosh computer, with its built in ability to generate a GEDCOM file, could not transfer its data to another computer. As a professional, I have yearly mandated CLE, Continuing Legal Education. The Arizona State Bar Association and the Arizona Supreme Court mandate 15 hours of classes every year including three hours of ethics. Since most genealogists are not registered professionals, there is no general education requirement. However Certified Genealogists by the Board for Certification of Genealogists require a renewal portfolio every five years. The International Commission for the Accreditation of Professional Genealogists also has a five year renewal process. There is a rather healthy debate over the effectiveness of a mandatory education requirement among attorneys, since they are argumentative by nature. Despite some of my own misgivings as to the effectiveness of continuing education, the idea that there is a need to update skills is absolutely defensible. If you read one out of ten of my posts, you know how rapidly technology and record availability are changing for genealogists. A document that could only be found in a courthouse or rented on a microfilm may be free online or perhaps available in a subscription site. It is just as important for genealogists to have their own continuing education as it is for any other avocation or profession. So where is this continuing education? The answer is simple, at your friendly genealogy convention. Throughout the year there are frequent conventions, big and small in all parts of the country. From a day-long local conventions sponsored by a local genealogical society to major national conventions held on a national basis. Two conventions I will be attending in the not too distant future are the Mesa Family History Expo and RootsTech. A Google search on "genealogy convention 2011" will give you a lot to choose from. The Mesa Family History Expo is a two conference in sunny Mesa, Arizona on January 21st and 22nd, 2010. The RootsTech event will be at the Salt Palace in Salt Lake City, Utah on February 10th to the 12th, 2010. Both have more classes and exhibitors than any could possibly have time to see or visit. Now what about the cost? As I mentioned above, an attorney like me here in Arizona, has to pay for 15 hours of continuing education at about $100 to $200 an hour. Not a day, just one hour. I can search around for "free" classes, but then I have to find something I can stand to listen to for more than an hour or so. So going to a three day conference like RootsTech for about $100 or so is a bargain. OK, what about travel and expenses? Many of the conferences are now publishing classes online. In addition, there are literally hundreds of online sources for classes from beginners to professional level. For example, FamilySearch.org has Research Courses for free. You can also get a huge amount of information and even full classes from Genealogy Gems Podcasts. There are a lot of other ways to get information. You can also find a full schedule of classes of some of the larger Family History Centers. The opportunities for learning more are really only limited by your own time and interest. If I need to learn about something, like programming wikis, one of my current projects, I purchase a book on the subject or find one in the library and go to work teaching myself what is needed. For example, my Grandfather was born in the town of St. Joseph, Apache, Arizona (Actually Arizona Territory). However, today the town is Joseph City, Navajo, Arizona. If I were to refer to the Standards, which would be the "correct" designation for his birthplace? One of the Standards for Sound Genealogical Research states, "avoid misleading other researchers by either intentionally or carelessly distributing or publishing inaccurate information." Why is listing the birthplace with its modern equivalent misleading? If I have to ask you the question, then you are being careless. Here is the reasoning. Genealogical records are most frequently stored in the area or jurisdiction where the event occurred. A common cause of inability to find records is looking in the wrong jurisdiction. If you were to assume that birth records for my Grandfather were located in Navajo county, you would possibly be wrong. I don't go very long without hearing a story about someone who spent a great deal of time looking in the wrong place. With today's online and program resources, there is really not much of an excuse for not knowing any county's historical boundaries. 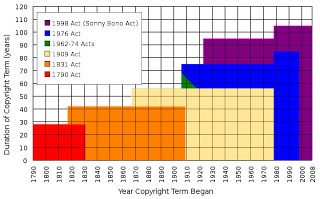 You might also try a program like Animap, now in version 3.0.2. There are any number of other such issues, such as recording alternate spellings, dates and locations and of course, the number one Standard, "record the source for each item of information they collect." Genealogist's viewpoint -- Macintosh or PC? To answer the question of whether to buy a Macintosh or a PC for use primarily by a genealogist, I have to make a number of disclaimers. First and foremost, I do not have a stake in either. I am not sponsored by anyone at the moment, although I do run Google Ads on my site. But also to be fair, I am one of the original Macintosh users, having been at the Mac Intro in San Francisco in 1984 and I have owned and used Macs continuously since that time. Reluctantly, when I got super involved in genealogy, I purchased a series of PCs to run the programs, especially after Personal Ancestral File no longer had a Mac version. I also had to connect to work on a Microsoft network and at the time, only a PC had the software to connect and run all the programs. Some of this I have reviewed before in previous posts, but this subject needed updating. Finally, about two years ago, all of the parts of the puzzle fell into place and there was no longer a reason to own or operate a PC based computer separate from my Macs. There were two things that happened to make this possible, first, the Intel based Mac computers became so fast that huge slow programs no longer made any difference. Second, the software program, Parallels Desktop, progressed to the point of usefulness. Now, I can run all of the PC software, RootsMagic, Ancestral Quest, Legacy Family Tree and whatever else on my Mac, faster and more conveniently than I could on a dedicated PC running Windows 7. So prior to about two or three years ago, I would have answered the question quite easily, stick with a PC. Now the answer is more complicated. Running Windows 7 on my Mac also gives me connectivity to my office through Remote Desktop. So, no reason to put up with PCs any longer. What about the cost? Aren't Macs more expensive than PCs? Well, that is really a loaded objection and usually comes from someone who has no intention of buying a Mac. It is similar to the issue of features and speed. Not too long ago, I had one of the IT personnel at work try to convince me he could build a PC from scratch that would out perform any Mac. That is sort of like saying I can build a car in my garage that is better than your Prius. Who wants to do that when you can buy a Prius? Who wants to spend the time trying a get a PC system to work when you can buy a Mac? While I was shopping for my last iMac, I compared HP and Dell feature for feature and in every case, the PC came out more expensive. You can always pay less if you get an older, slower computer with fewer features. In computers, unlike many other products, you usually get what you pay for. There is so much competition, that differences in price are usually (not always however) reflected in differences in the product itself. If you need to buy a computer and want cheap, buy a PC. There are whole systems under $500. But don't expect to get a graphics powerhouse. Here is the other issue. Have you ever sat down and used a Macintosh computer? If not, don't go around giving advice on what type of computer to buy. I have used almost every type of PC and Mac since 1982 and I will take a Mac every time. I use PCs all day long at work on our office network and until recently, I had a PC at home. What do I have to do to run genealogy programs on my Mac? Well, you have two options. Use Macintosh genealogy programs or run Parallels Desktop and run all of the PC programs. Either way works fine. I have no more trouble transferring data from and to my Mac programs then I have between computers and programs on the PC. Since Family Tree Maker has released a Mac version, there is one more really good genealogy program for the Mac. But there were already a number of good programs including Reunion, MacFamilyTree and others. Here is the one big obstacle to running everything on the Mac. It takes a lot of experience and quite a bit of patience to run two completely different operating systems on one computer at the same time. If you don't want to learn about operating systems and computers, stick with one or the other. Don't try both at the same time. But unless you have some overriding reason for purchasing a PC, like it is free or something, you should seriously consider a Mac. I recently stopped using my PC laptop for a MacBook Pro and don't have the time right now to tell you how much better I like the MacBook Pro than my old PC laptop. Now the real issue for me. I do a lot of graphics. We own a graphic design company. I am a professional photographer. I scan thousands of documents. All of these things can be done easier and faster on a really fast Mac computer. Enough is enough. Any questions? Let me know. Participating in a Bloginar? Whatever that is? The agenda is already in the FamilySearch.org Wiki under "FamilySearch Bloginar Presentation." This page gives an outline of the presentation and states, "Bloginar presentation and recording will be made available following the bloginar." (Emphasis in the original). As a side note, if you want to know what is going on in the Wiki world, search on "webinar." At the time of the Webinar/Bloginar I was just getting back to my office and was a few minutes late loggin on. I also left the address and instructions home, so I had to call home to get the information and then logon. The format allows written questions that appear online in a sidebar to the main presentation. It was very helpful to see the questions and comments made during the session. The audio portion of the session was by telephone and it would help to have a speaker phone so you could type and listen at the same time. It took me a couple of minutes to get setup but then the whole thing worked perfectly. I was familiar with the whole process because I get most of my Continuing Education requirements by listening to online or telephonic seminars. They save travel time and other expenses. The process is also very similar to Podcasts. But mostly those are one-way watch and/or listen experiences. The Webinar/Bloginar format or program came from Adobe Connect. If you would like to see a video explaining how this all works, go to AdobeTV for "What is Adobe Connect 8?" Light Peak? Sandy Bridge? Ivy Bridge? Lion? If these codenames mean anything to you then you are technologically savvy and probably can make your own predictions about the future impact of technology on genealogy and genealogists. Just for information sake, Light Peak is the next major upgrade in a proprietary optical cable interface from Intel it is being developed as a replacement for SCSI, SATA, USB, FireWire, PCI Express and HDMI. Simply put it is a way to connect things like hard drives and flash memory to your computer that is much, much faster than present connectors. Sandy Bridge and Ivy Bridge are new CPU chips also from Intel. Lion? The next operating system from Apple. All of these faster and more complex items are supposed to be introduced in 2011. Hardware: Faster chips with more processors. Laptops will get thinner and lighter. The distinction between cell phones, tablet computers and laptops will become even more blurred. Google and Apple will battle it out for market dominance in hand held devices. Right now, just in case you don't watch any TV, hardware is being driven by computer game manufacturers who are making interactive games where your movements and gestures are incorporated into the game, for example, Wii from Nintendo and Kinect from Microsoft's Xbox. All of these devices and many more are becoming compatible with Internet connections to download movies and TV shows. Two major issues that are growing in importance because of these changes are converting from a telephone land line to wireless service and dropping cable service in favor of obtaining all of your TV/Movies from the Internet. The difference between a "TV" and a "Computer Monitor" has largely disappeared and will continue to disappear during the coming year. There will be any number of ways to watch TV shows on your computer or work on your computer on your TV. Although this impacts genealogists as consumers and people, we don't really get any real advantages either way. I do appreciate faster Internet connections and hardware connections for backing up my huge databases but otherwise, whether or not I can see the latest TV series on my computer or whatever leaves me absolutely cold. I could care less about TV. Now, there is another side to all this that does benefit genealogists. Webinars and other Internet video content. FamilySearch.org has over 100 online genealogy classes and I just participated in the first ever FamilySearch Bloginar online. These activities will continue to increase during the coming year and will become easier to host and attend through the hardware changes. Operating Systems: Apple will have a new operating system called Lion. Microsoft hasn't announced a new system and may pass up a year now that Windows 7 is selling well. This probably doesn't mean much to someone who is still running Windows 95, but new operating systems mean new software and updates to programs. Software: Every currently sold commercial program will have one or more updates in 2011. 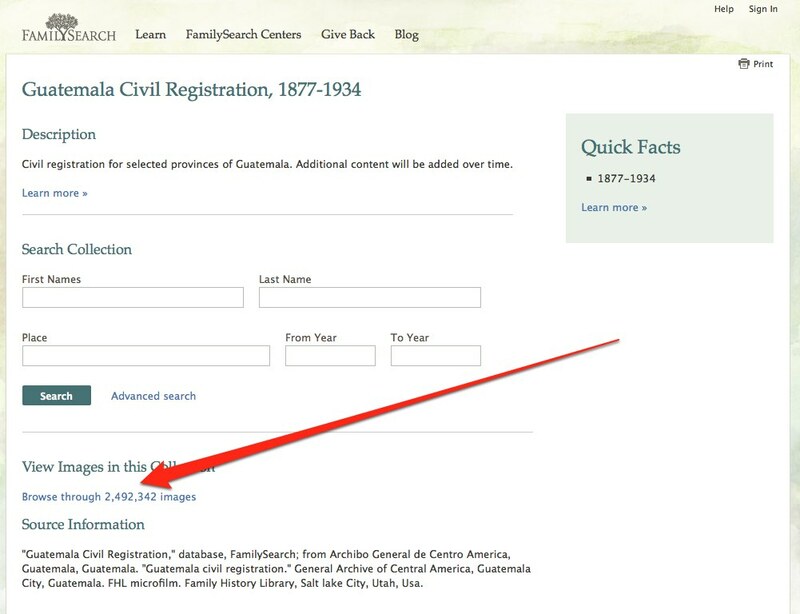 Well, perhaps you haven't noticed yet, but the new FamilySearch.org website does not emphasize the download for Personal Ancestral File. 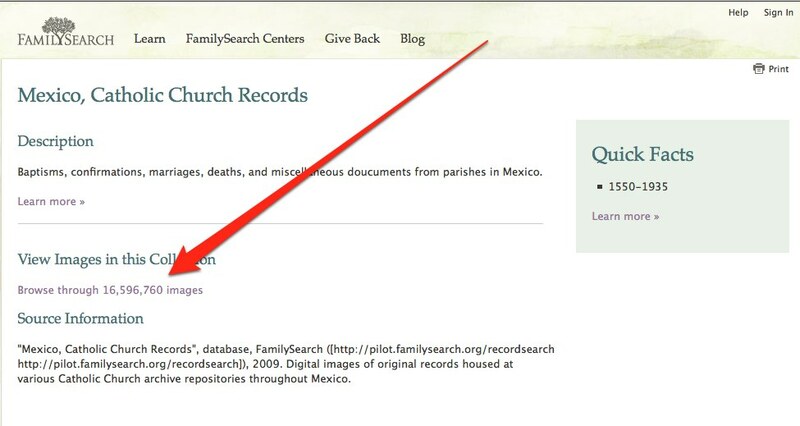 You can still get the program by going to the FamilySearch Downloads page but how to get there is not obvious. The page is in the Wiki portion of FamilySearch.org. Internet: More software applications will be developed on the Internet, called "Cloud Computing." Open source software, such as OpenOffice, will continue to erode traditional methods of software development.When you store your genealogy online using an online program like Ancestry.com or MyHeritage, you are technically using "Cloud Computing." Cloud computing is Internet-based computing, whereby shared resources, software and information are provided to computers and other devices on-demand, like electricity. This will obviously increase during the coming year. Now to genealogy. 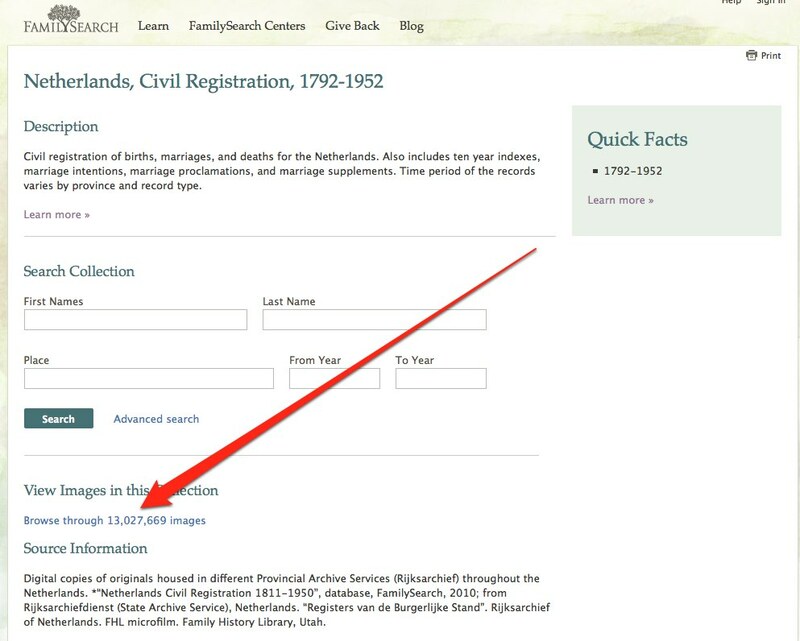 FamilySearch will continue to develop FamilySearch.org and will introduce a lot of new features including improved searching. Millions and millions of Historical Records will be added to FamilySearch.org (a very safe prediction). New FamilySearch may begin to make its way out of the dark forest and show some editorial improvement. Hmm. I can't say that for sure but I do have confidence in the FamilySearch team, they are fantastic people and if anyone can figure out how to make New FamilySearch into a viable online resource, they can. OK, all that is pretty safe stuff. for genealogists who are just now considering upgrading either their hardware or software, they are going to see some really good deals in hardware and about the same selection of software. Is it time to upgrade? It is always time to upgrade. If you are hesitant or nervous about changing computers or programs, keep reading my posts, I will continue to talk about new technology. But, if you want some indication, I just recently bought a MacBook Pro. I think now is a good time to buy. If you had trouble with all the acronyms and technical jargon, it will only get worse in the future. I suggest using Google (or whatever) and type in "define: whatever" and get the definition if you need one. Already irate over new FamilySearch.org website?